"Nothing I have ever done is of the slightest practical use." Research at Rutherford's Cavendish laboratory included the existence of the neutron and the discovery of the isotopes of the elements, fundamental science that has had significant technological fallout. It now appears that some fundamental studies of the way that brittle materials fracture may lead to an important correction in our understanding of the affect of atmospheric dust on insolation. where Nf is the number of fragments with size Df. It's not surprising that atmospheric dust has a big impact on the amount of sunlight that reaches the ground. Jasper F. Kok of the National Center for Atmospheric Research, Boulder, Colorado, has just published a paper in the Proceedings of the National Academy of Sciences [2-4] that demonstrates that the scale-invariant fragmentation of brittle materials is applicable to dust that's emitted into the atmosphere. The result is that current global circulation models overestimate the fraction of clay particles of size less than two micrometers in diameter in the atmosphere by a factor of 2-8. As a result, there are many more dust particles in the atmosphere than previously thought, since the fractured dust particles produce many larger fragments. These errors have led to an overestimate of the radiative cooling of a given quantity of emitted dust. Dust particles in the atmosphere range in size from as large as 50 micrometers down to 100 nanometers in diameter. The larger particles, defined as silt particles, remain aloft for a few days; but smaller, two micrometer-sized, clay, particles will remain for about a week. Because of their long residence time, the clay particles will encircle much of the Earth, reflecting heat back into space. The present global circulation models assume a far greater fraction of heat-reflecting smaller particles than are actually present. The PNAS paper says that the ratio of the larger silt particles to the smaller clay particles is two to eight times greater than previously thought. 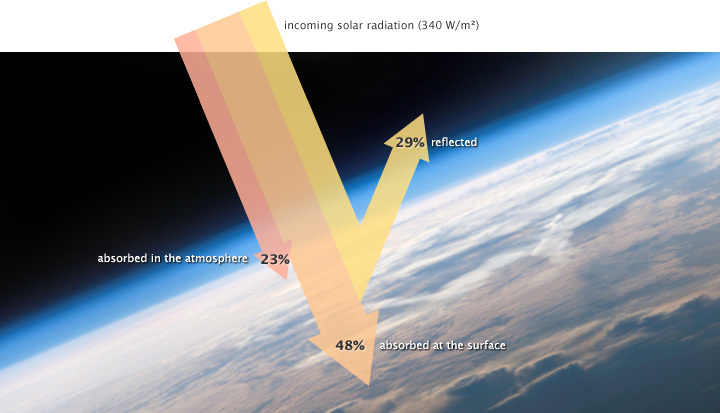 Affect of atmospheric dust on Earth's insolation. Aside from the apparent implications for weather forecasting in dusty regions, there are other, subtle effects in Earth's ecosystem. The oceans may receive more iron from airborne particles, which will have a fertilizing effect on marine flora. Growth of marine plant matter is a carbon dioxide sink. Dust also falls on mountain snowpacks, which accelerates the melting of snow. As for the useless and esoteric number theory - It would be a surprise to Hardy that number theory has actually become useful to such things as public key cryptography. Pun intended, but probably in bad taste. "Broken glass yields clues to climate change," University Corporation for Atmospheric Research News Center, December 27, 2010. Cheryl Dybas and David Hosansky, "Broken Glass Yields Clues to Climate Change," National Science Foundation Press Release 10-243, December 27, 2010. Jasper F. Kok, "A scaling theory for the size distribution of emitted dust aerosols suggests climate models underestimate the size of the global dust cycle," Proc. Natl. Acad. Sci., vol. 108, no. 3 (January 18, 2011), pp. 1016-1021. Linked Keywords: Ernest Rutherford; Cambridge University; Cavendish laboratory; number theory; Godfrey Harold Hardy; G. H. Hardy; neutron; isotope; chemical elements; brittle materials; fracture; insolation; fracture studies; Alan Arnold Griffith; Griffith's criterion; ultimate strength; scale invariance; power law; National Center for Atmospheric Research; Boulder, Colorado; Proceedings of the National Academy of Sciences; global circulation model; clay; micrometer; radiative cooling; nanometer; silt; weather forecasting; ecosystem; iron; flora; carbon dioxide; snowpack; public key cryptography.